During most days and evenings, from our office window (a block away from the Amtrak station) and along Sand Creek, WIRT watches and documents westbound, Burlington Northern Santa Fe (BNSF), unit coal and oil trains crossing downtown Sandpoint. So we are happy to alert regional residents to the additional opportunity to monitor fracking proppant/sand train movements. Olympia Stand and WIRT organizers ask that all of us notice and report to them any groups of a dozen, whitish, covered, eastbound rail cars carrying fracking sand from the Port of Olympia to the Bakken Basin in North Dakota. Traversing the region first as unit trains on a short rail line to a Seattle train yard, then as parts of mixed freight trains on mainline BNSF tracks through Spokane, north Idaho, and the Montana Hi-Line, the hopper cars have a key, confirmed feature of two (not the usual three) square, funnel-like ports on their bottoms. To accomplish this trainspotting and report proppant cars, please view the color and shape, number of cars, and overall train composition in the clear photos and videos of the rail cars provided in these links, especially the Olympian video of the heavily guarded train rolling through Olympia after the blockade [3-5]. Together, Northwest climate and indigenous activists are observing and noting the amount of time typically required for fracking supplies to move from Olympia to Sandpoint to North Dakota. Olympia, WA – A coalition action group, Olympia Stand, comprised of climate action, indigenous solidarity, and port militarization activists, has staged a human blockade on the train tracks leaving the Port of Olympia, Washington. A train transporting fracking proppants to the Bakken Basin in North Dakota, the source of oil for the Dakota Access Pipeline (DAPL) and explosive oil trains, has been prevented from leaving the Port of Olympia. 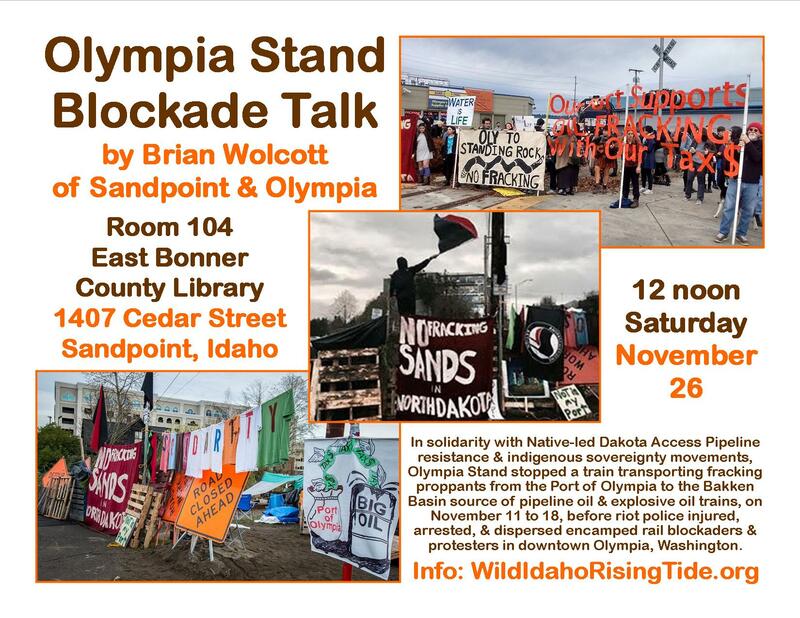 Olympia Stand is a direct action coalition actively resisting the transport of proppants through the Port of Olympia to the Bakken Basin in North Dakota. Its activists are inspired by the water protectors of Standing Rock, and work in coalition to expose and reject Olympia’s complicity in the occupation and desecration of indigenous lands, by focusing on direct action and civil resistance. The overall goal is for the Port of Olympia to not enable the use of climate-damaging fossil fuels or their infrastructure. According to a U.S. Department of Defense report, climate change is the greatest national security threat to the United States. In order to reverse the damage we have already done, the global scientific consensus is clear: We must transition to renewable energy, and keep all oil, coal, and natural gas in the ground . We demand that the Port of Olympia permanently cease fossil fuel infrastructure shipments through the marine terminal. In lieu of acceptance of this demand, we will continue to oppose any transportation of fossil fuels through the Port of Olympia. The action started at the intersection of State and Jefferson streets just before 2:00 pm. By 3:00 pm, the train reversed back into the Port, to the cheers of the train blockers. Soon after, the text message “We hold the track,” along with a call for action support to resist movement of the fracking proppants through the night, was sent by Tri Imani of Olympia Stand. As of 7:30 pm, train blockers held the tracks. The train stoppers are carrying signs expressing solidarity with the fight of the Standing Rock Tribe against the Dakota Access Pipeline and associated, explosive, Bakken oil trains. They chanted “Water is life,” “You can’t drink oil,” and “Take our port back; join us on the tracks!” Many drivers honked in support, as they passed by the blockade site. Though today’s action was inspired by Standing Rock DAPL resistance, area climate justice activists have been resisting Port of Olympia fracking materials for Bakken oil extraction since 2012. The Quinault Nation has led the opposition to proposed Grays Harbor oil terminals in Hoquiam, which would draw additional Bakken oil trains to our region. See the video, released by Zoltan Grossman, of the November 11, 2016 Olympia Stand action . For background on fracking sands at the Port of Olympia and Bakken oil fracking, see the No Oil Fracking Sands at the Port of Olympia website . Email olystand@protonmail.com for information on the unfolding action. A train transporting fracking proppants to the Bakken Basin in North Dakota, the source of oil for the Dakota Access Pipeline (DAPL) and explosive, Bakken oil trains, was prevented from leaving the Port of Olympia for almost seven days, before massive police repression dispersed a blockade in downtown Olympia, Washington. The action began on Friday, November 11, when activists got word that a train shipping fracking proppants was set to depart. People mobilized immediately and confronted the train, forcing it to reverse direction, back into the port. Protesters assembled an encampment, complete with tents, sitting arrangements, food, music, and a dishwashing station, on the tracks on the edge of downtown Olympia. Other physical barricades to complement the encampment were constructed along the tracks, to shut down all Port of Olympia commerce that travels via rail. Protesters vowed to maintain the blockade until the Port of Olympia agrees to permanently cease all shipments of fracking materials. The blockade was a concrete expression of solidarity with the anti-DAPL resistance led by Native water protectors at Standing Rock and with local indigenous movements for sovereignty. This action follows in the footsteps of previous movements surrounding the Port of Olympia and the stolen land it occupies. Past actions include preventing shipments of military cargo during the Iraq War and reinforcing water, fishing, and hunting rights of local tribes. At 4 am on Friday, November 18, a joint raid was collectively staged by Union Pacific security agents and the Olympia Police Department, Thurston County Sheriff’s Department, and Washington State Patrol. Though riot police outnumbered protestors by four or five times, the eviction was resisted for approximately 30 minutes. Law enforcement officers then advanced, tearing down tents and barricades, and arresting 12 protesters. Another group of protesters emerged downtown, to prevent the train carrying fracking proppants from departing on the cleared tracks. An overwhelming police response deploying “less-lethal” weapons, such as pepper balls and flash grenades, ultimately succeeded in dispersing demonstrators, but not without imposing injuries on numerous protesters. Although the blockade has been dismantled, protesters have vowed to continue the fight, and it is likely that the Port of Olympia will hesitate before accepting fracking proppants for years to come. If activists in other cities stage similar blockades, the economic viability of other ports’ or rail companies’ complicity in fracking could be compromised. For further information and regional and national news coverage of the blockade, see the Olympia Stand public facebook group and enclosed article links [1, 9-18]. Supporters can contribute toward the legal funds of the arrestees at a YouCaring donation site . Washington: Protesters Blockade Trains Carrying Fracking Materials to North Dakota, November 16, 2016 Democracy Now!